Commodity Innovation Lab | With “Virtual Coops” On the Rise, Will Traditional Agriculture Coops Go Virtual? With “Virtual Coops” On the Rise, Will Traditional Agriculture Coops Go Virtual? “Today we’re seeing that a moat—a barrier that protects a company from low-cost competitors or new, disruptive technologies—isn’t enough to build a lasting business. A moat simply buys a company time to figure out the next great business. Just like the invention of field artillery in the 16th century rendered moats obsolete, technology today is grinding down barriers to competition. Technology makes the moat of traditional business a mere jumping off point. For tech companies, it’s always about what’s next — not simply protecting what’s here today. Many agricultural cooperatives are facing challenges with respect to globalization, industrialization of agriculture, democratization of technology, and competition from large multinational corporations in the agri-food and forest industries. 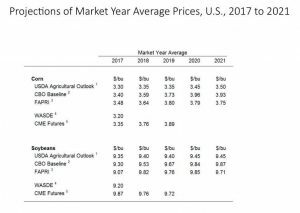 According to USDA, as of 2015 (the latest annual report), from the 2047 total US Agriculture Coops, 1079 are Marketing Coops, 874 are Supplier sales and 94 are associated to Service. 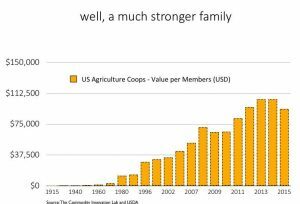 Therefore given the business size and their entrenched value to rural communities, US Agriculture Coops have become the fabric of rural US, and combined they are the largest Agriculture merchants and originators. Loyalty and Commitment are key values in a cooperative environment. They are sine qua non for the success and adaptation of coop enterprises. These two values not only relate to the consistent patronage of cooperatives, but also their participation in decision-making, investments and contribution to the firms’ development. Members’ commitment and loyalty are necessary for the adaptation of the cooperative in an ever-changing economic and institutional environment. Member loyalty and commitment are often expressed as “social capital.” The social capital created within the organization has been claimed to be the cooperatives most valuable asset. 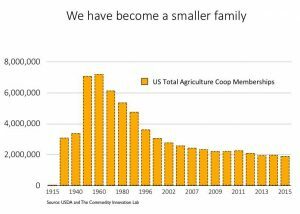 So what makes a farmer loyal to a Coop? Are Coops becoming part of the change that the 21st century farmers seek? Can coops be the technology advocates for the farmers to the farmers? The same network fabric that has sustained its existence since the 1920’s is beginning to question the future of its value proposition. 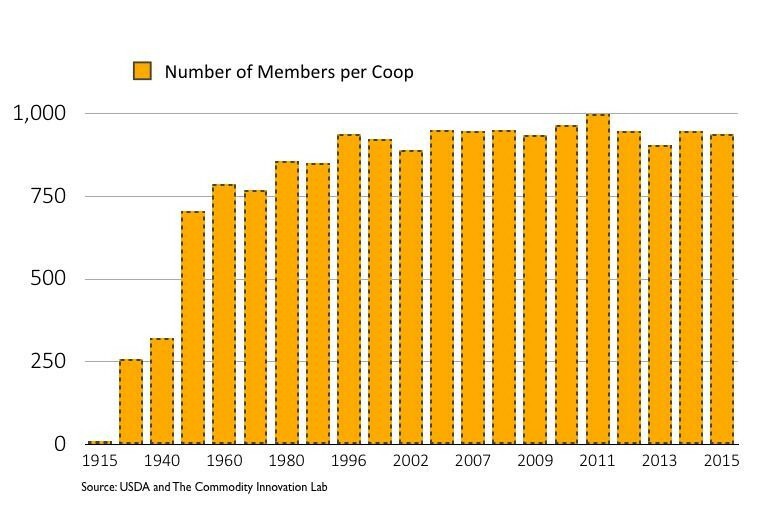 A consistent drop in Coop Membership for the past 85 years has been associated to rural exodus (social-economic drivers), technology adoption which led to a reduction in labor use and an increase in farm sizes; departure from analog to digital; democratization of the digital world which has been transforming farmers into independent business owners and finally, an individualist ethic that has increasingly entrenched itself within the Western culture. Dissatisfaction is a motor for change. In a study promoted by the USDA in 1998 US dairy farmers were asked for positive and negative factors that impact farmers recruitment into an Agriculture Coop. Positive Impact means that the greater the measured value of these characteristics and the more intense the belief, the more likely a member recruited others to join the cooperative. These characteristics included: 1) Coop size; 2) Belonging to the cooperative is an important part of my identity as a farmer; and 3) Level of influence on Coops governance. One characteristic was found negatively related to recruitment of new members. 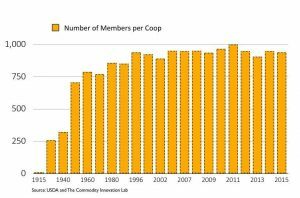 The more intensely members agreed that “the cooperative primarily benefits large farms,” the less likely they were to recruit additional members. From the study, Farmers participation in Coop meetings and the daily life of the Coop are highly correlated to the size of the farm (acreage and size of milking herd). The combination of a larger financial risk and more staff allows for larger farmers to dedicate incremental amounts of their time to become influencers on the Coop business. About 30% of the farmers surveyed believe they don’t have a voice. There is one missing ingredient that is crucial to understand the relationship between farmers and Coops. It is TRUST. A study produced by the University of Missouri, in 2004, with 2000 corn and soybean farmers to evaluate whether cooperatives are characterized by greater trust than investor-owned firms, found that trust and farmer perceptions of trustworthiness and competence are higher in cooperatives than in investor-owned firms and that trust is a significant factor explaining the choice of farmers to market to cooperatives rather than investor-owned firms. 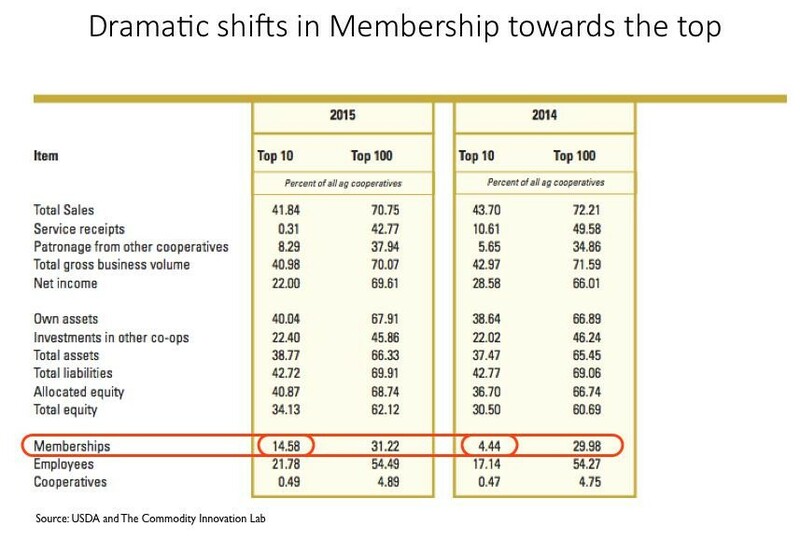 which means that smaller and/or less profitable Coops are disappearing and mega Coops are emerging. 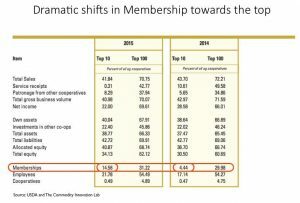 The Top 10 Coops have experienced an increase in membership of 10.14% in a single year, from 2014 to 2015 (see table below). 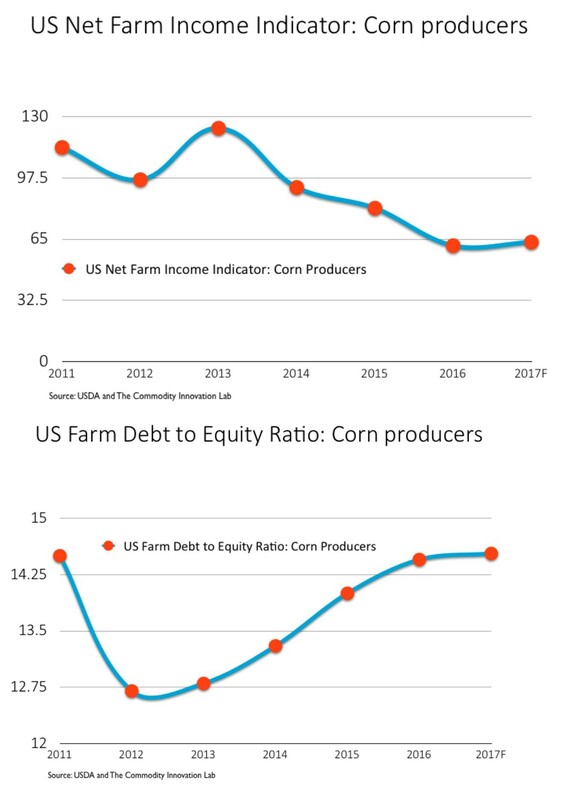 Adding to the fire, net farm income, farm debt-to-equity ratio and price forecasts (Corn) are not showing a much positive sign for current and upcoming years. 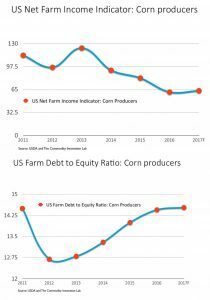 Farmers understand more about profitability than prior. They are starting to operate as portfolio managers, seeking to optimize crop inputs and expand knowledge of their field by managing farm data. 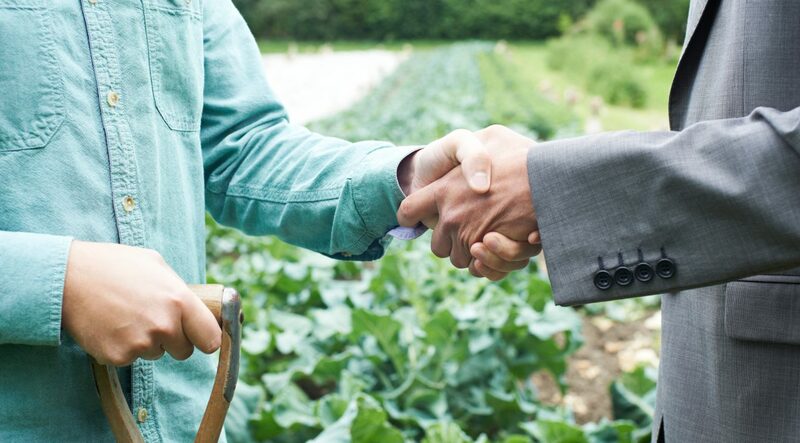 Farmers are more eager to venture into their own by establishing individual commercial partnerships and even sell directly, a trend that we started to see 5 years ago with supermarket and retail chains going straight to producers and establishing co-branded products (white label). Also, with the advent of several technology companies venturing into developing domestic or global Marketplaces combined with an improved and cheaper access to communication tools (WhatsApp, Skype, Message) have allowed farmers to look over their fence. Farmers have always had the will to go direct but now they have a new partner, technology, allowing them to seek an INDEPENDENT route to increase profitability on their own terms. In order to look at market “Independence” below are some selected analog indices in hopes of portraying the new mindset. 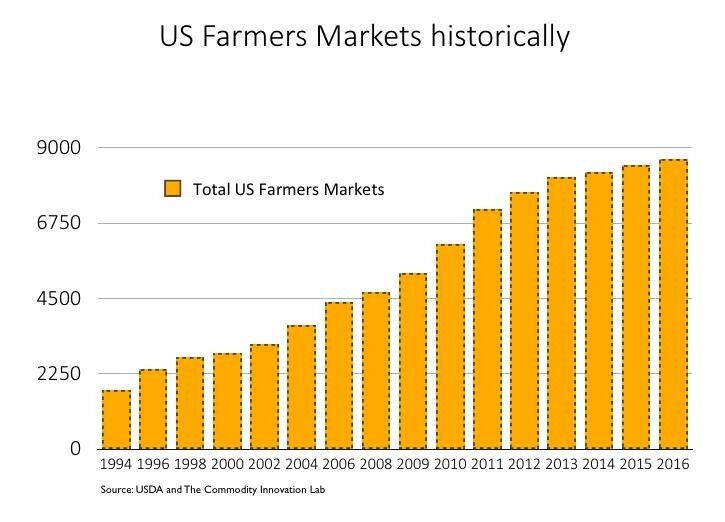 The chart below depicts historical growth in US Farmers markets. 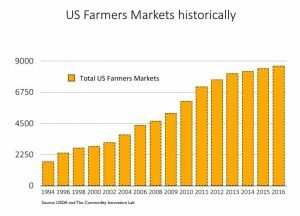 Values show a depart from 1,755 US farmers Markets in 1994 to around 8,669 in 2016. A 5x increase in 12 years. 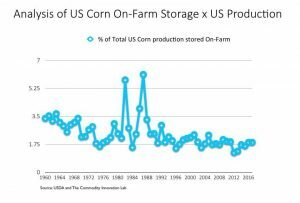 If farmers want to begin to have better control of their own future than we should look no further than On-Farm storage. 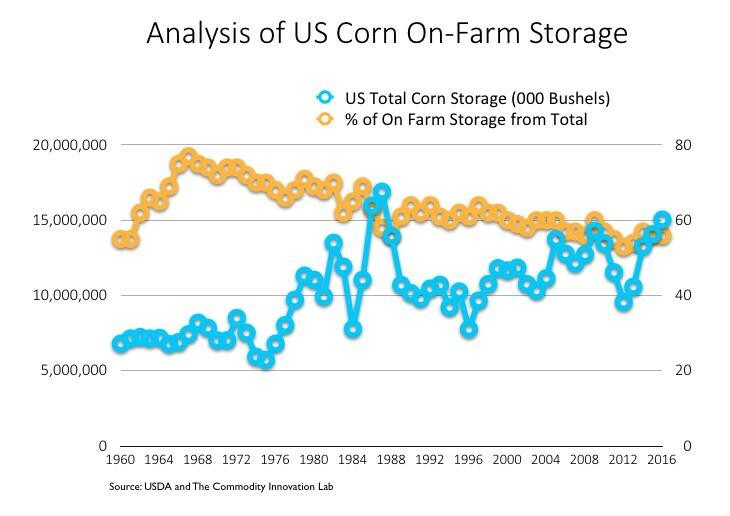 Below is a chart containing On-Farm US Corn Storage (000 Bushels) compared with a percentage from Total Storage (On-Farm + Off-Farm) for the past 40 years. 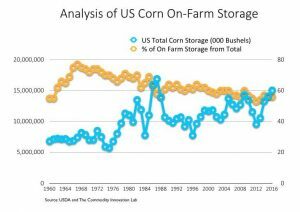 Interesting to notice that for the past 5 years the percentage of On-Farm Storage has increased in relationship to Total storage, from 53% in 2012 to 57% in 2016. 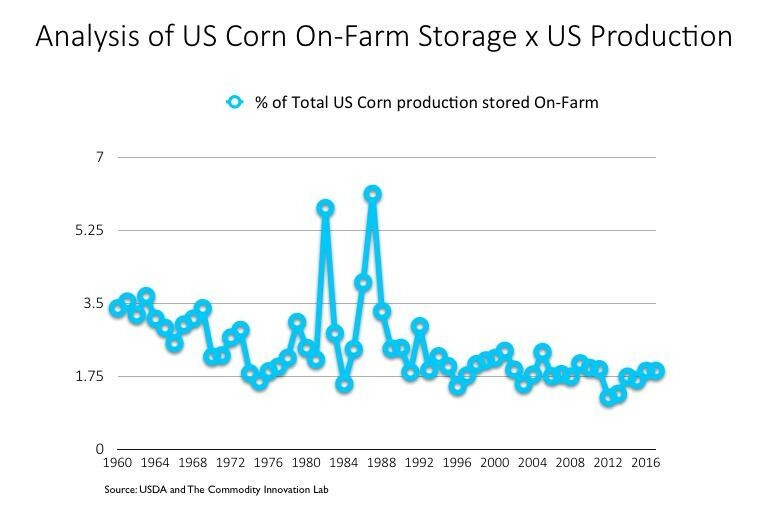 The Total US corn production stored On-Farm has increased from 1.2% to 1.9% in the last 04 years. That is a substantial change for a historical downward trend in the previous years. 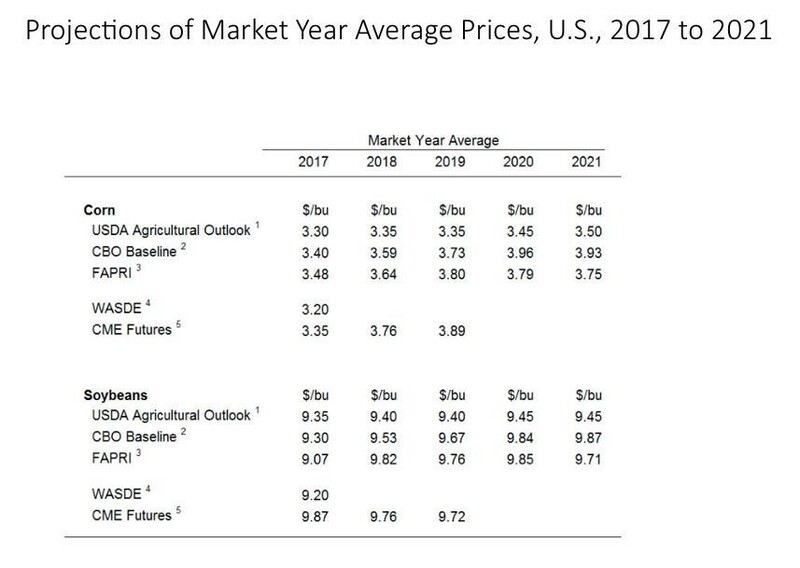 A historical positive trend is also correlated to better at-farm prices. Lack of available employment at farmers disposal, specially when it comes to high intense Agriculture labor job sectors such as Horticulture, Dairy farms and perennial crops (Coffee, Cocoa and fruits) have really pushed farmers to seek efficiencies elsewhere. That is where Off-Field and On-Field technologies have come into place. Look no further than Salinas, CA for a great example of employment impacting technology and how a partnership between AgTech and the local Coop was able to take producers to the 21st century. Based on already approved immigration bills and proposals sitting on US Congress, an increase in US immigration barriers is more likely and will only strengthen the case for alternative solutions. So can Coops be a solution for 21st century farmers needs and Can coops be the technology advocate for the farmers to the farmers? Absolutely. 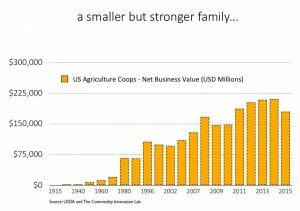 Coops can be a place to adapt and disperse technology innovation. Unfortunately, in most cases, adoption has been slow due to a lack of a technology innovation culture. But a strong point is that Coops should be agnostic regarding data and service providers as long as efficiency realities meet stakeholders’ expectations. So what are the potential solutions for an Agriculture Coop? Create a Data / IT driven board: Develop a technology data culture to nurture innovation from top to bottom and therefore encouraging a bottom up innovation environment. Extend your legal relationship with your farmers by adding data to this new equation. On paper farmers work very hard to generate a single data acreage output, it is time to allow them to benefit by expanding the legal rights framework. Develop an “open source” and fair value driven marketplace channel that connects members and non-members to openly trade goods and eventually goods and services. 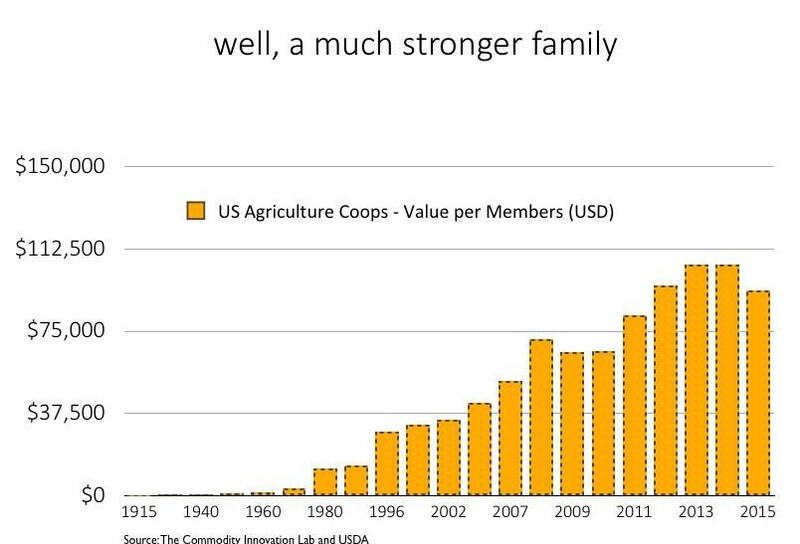 If farmers are the fabric of rural America, Coops have historically become their safe heaven. 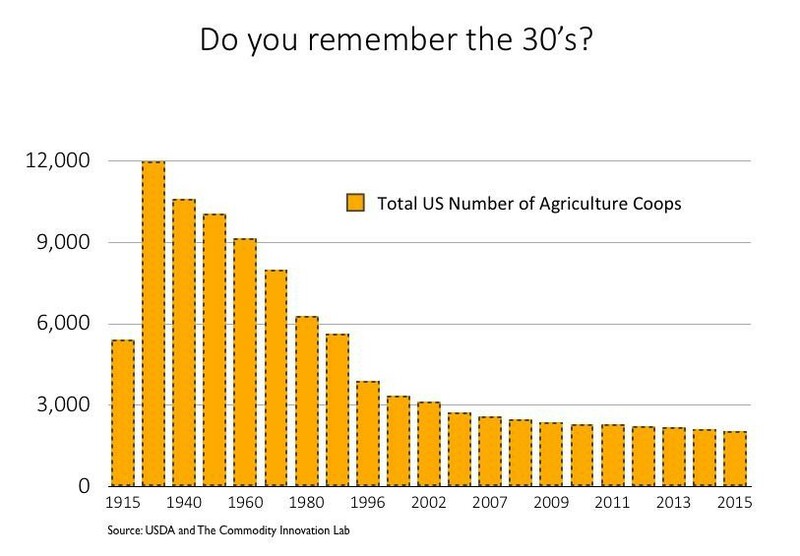 This is why the transition between a 100% Coop channel dependency to somewhat of an agnostic operation is part of the existential question that most likely runs through the minds of every farmer during every single crop year. Us Agriculture Coops go through (without properly managing), billions of interactions in the form of commercial transactions (Marketing and/or Supply), technical assistance (extension services) potentially transforming some of the large ones into regional and national indicators of crop health and farmers wellness by potentially carrying a Real Time pulse of the regional markets they come to serve and benefit. Success will exist in the form of developing a technology culture followed by a set of executable tasks to enhance farmers’ service satisfaction, engage the new generation by promoting data transparency and eventually expand its services by becoming a regional tech solution hub. The old currency was called TRUST. The new trust is called DATA.